It's 18:00 in Escondido, USA right now. 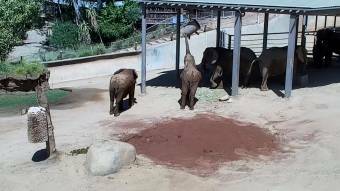 San Diego Wild Animal Park: Elephants Live video from the Elephant exhibit at the San Diego Wild Animal Park. Escondido, California: Boulder Knolls Observatory, 0 miles away. Escondido, California: NB 15 & Via Rancho Pkwy, 0 miles away. Ramona, California: Ramona Weathercam, 13.7 miles away. Del Mar, California: Del Mar Fairgrounds, 15.2 miles away. Del Mar, California: Beachview, 15.2 miles away. Carlsbad, California: Ocean and Lagoon View, 15.5 miles away. Oceanside, California: SB 5 at Oceanside Blvd, 17.8 miles away. Palomar Mountain: View from the Palomar Mountain, 18.5 miles away.